As most readers of this probably already knows. Cragne Manor, has been released. Back in June, Ryan Veeder and Jenni Polodna organized this twentieth anniversary tribute to Anchorhead. Eighty-four people signed up to author a room. Each author, being assigned a room, worked independently, not knowing what the other authors were doing. Ryan and Jenni, built the map and handed out the assigments, with minimal instruction. Nothing more than what your connecting rooms were and some minimal instructions on an overarching goal of the room. For example, your room may have to contain a certain object or include a puzzle utilizing one object to get another. How you implemented this was up to you. Some rooms may flat out give you the information needed in some atmospheric way, some may just contain a simple obvious puzzle, some are much more difficult and could be full games in themselves. I was one of the authors and given my time spent on Trizbort over the last few years, I’ve done very little game development, so this was a lot of fun for me. What’s cool about this, is that I know nothing about the rest of the game, other than what little I made it through in testing the beta versions. I’m not even sure how far into the game my room is, nor how important my room is to the overall game. So check it out, it’s long, it’s probably got bugs, but I suspect it will be a lot of fun. Ryan and Jenni did a great job and spent a lot of time pulling this all together and bringing our mishmash of story and code into one cohesive pile. Much thanks and credit go to them for their work on this! Time for another Trizbort update. This update focused on one new feature in particular. Now rooms can have different shapes. This is something I’ve wanted to put in for a long time, and it was actually relatively easy to get in. It has been a bit more difficult to get to work properly. There is still some work to do especially in regards to how connections work with the elliptical and rounded corners, but for the most part they aren’t too bad. Please let me know if you find any issues. Room shapes are obviously the biggest new feature (in fact it really is the only new feature). You now have the abillity to create elliptical rooms (Ctrl-E), rooms with rounded corners (Ctrl-R) and individual rooms can have straight edges (Ctrl-H to toggle), instead of the all or nothing hand-drawn vs straight edges. You can make the change to selected rooms with the shortcut keys or from the menu (main or context). If you go into room properties, you can also adjust the room shape. 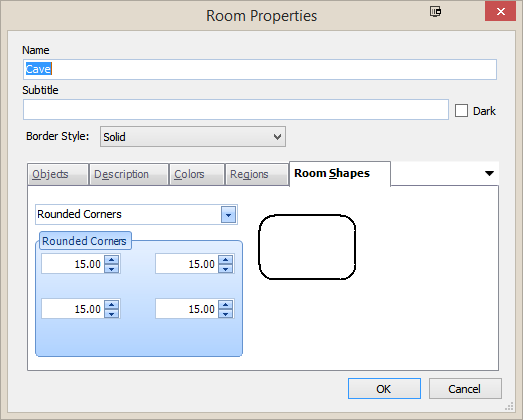 Currently the rounded corners room is the only one with some additional properties that can be set. You can adjust the radius of the each of the 4 corners. The range is from 1 to 30 for each corner to allow for some differing shapes. 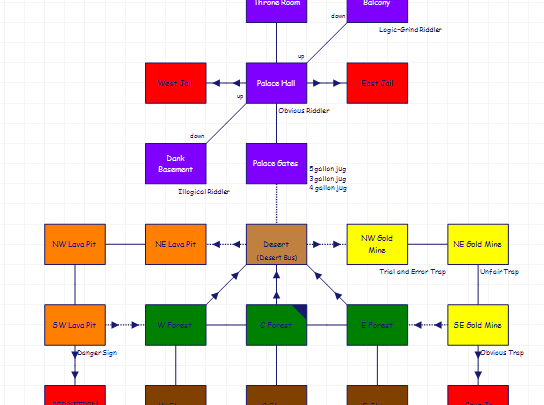 Also in this version I cleaned up the menus. Now instead of the edit menu being incredibly long, I broke out Room and Connection specific items into their own respective menus. This leaves us with much more manageable menus. 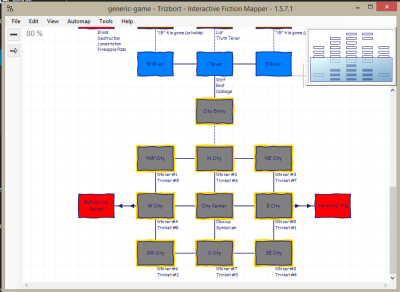 I also updated the context menus so that all the appropriate items would show over the appropriate items on the map. As usual go to http://www.trizbort.com for the latest released updates or go to the github page for the latest and greatest (or not so greatest) code. Released version 1.5.8.7 tonight. This released focused on a few new features and some bug fixes, but the other nice thing is it now includes bundled in the release (as well as in the main repository on GitHub), the documentation that Andrew Schultz has been working hard on. Individual rooms can now have their own border style (including no border at all)….this allows for creating rooms that might have special meaning based on their border styles. Individual connections can now have their own color. Helps to distinguish special connections by their color. The automapper now handles UNDO a little better thanks to GitHub user matthiaswatkins. I hope to see some more submissions from him! Release can be found at: http://bit.ly/trizbortjl1587 – note links from earlier posts may not work, this link will get you the latest version. Source code can be found at: http://bit.ly/TrizbortSource – don’t forget here you can submit issues or feature requests. Hope you enjoy this release. We have more features and improvements lined up to be developed soon. Also be on the lookout for a new website dedicated to Trizbort (I hope to get that in the works here soon). Enjoy! Of course you can find the original Trizbort at http://trizbort.genstein.net/. I’ve had a few chats with him and he has been very supportive and excited that some work is being done and people are continuing to use his creation. Thanks to him for the original! Version 1.5.8.5 focused on adding a few features and fixing up a few bugs that have been around for quite a while. Look at the revisions.txt in the download file for a complete list. ++ The smart save is a bit more customizable as to what is actually saved. Look in the App Settings. ++ Added a zoom level textbox in the status bar, to more finely control the zoom level. ++ Added additional 2nd fill color styles. They are slightly redundant, but seems more complete now. ++ continued improvement to the user experience for keyboard users. — Fixed F11 crash when automapping was turned off. 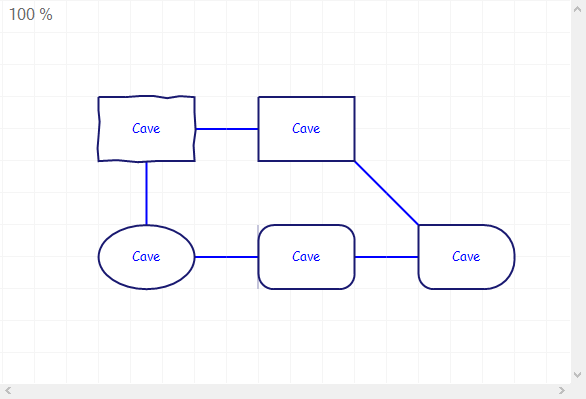 — fixed exception during copy/paste of multiple rooms and connections. — fixed some color display issues on selected rooms with object text inside the room. — fixed display error when adding rooms that were none standard in size. I released today another version of Trizbort (1.5.7.1). This version focused mainly on fixing some bugs and making the app a bit more user friendly for keyboard users. There were a few new features that I think are pretty nifty. First with the bugs. I thank everyone that made suggestions and reported bugs as they were much appreciated and made my job much easier. Made the naming of regions a bit more robust as the user could enter some characters that would either break the save file or would break Inform if exported to code. I also made the region setup form a bit more robust as there were a few ways to you could break the app if you tried hard enough. I tried to clean up the exporting to Inform7 by making sure the app wouldn’t generate bad I7 code. Some of these changes naturally fall through to I6 and TADS3, but I still need to do some work there as I’m not as familiar with those languages. SmartSave better handles an unsaved Trizbort file better. Selected rooms and connections are now much more noticeable and it doesn’t really interfere with the coloring of regions. New keyboard shortcut (Ctrl-Shift-A) to select all rooms of a particular region (I’ll add a menu item later for you mouse users). Select one room of the region you are interested in and press Ctrl-Shift-A and viola that region is selected. Ctrl-Alt-Arrow to resize selected room. That keystroke is pretty standard to handle resizing so I wanted to be sure to include it. Arrow keys will now move selected rooms around. Previously the arrow keys always moved the map, now if you have rooms selected it will move the rooms instead. Nothing selected still moves the map as before. Added some more context menu items and shortcut keys for quick access.